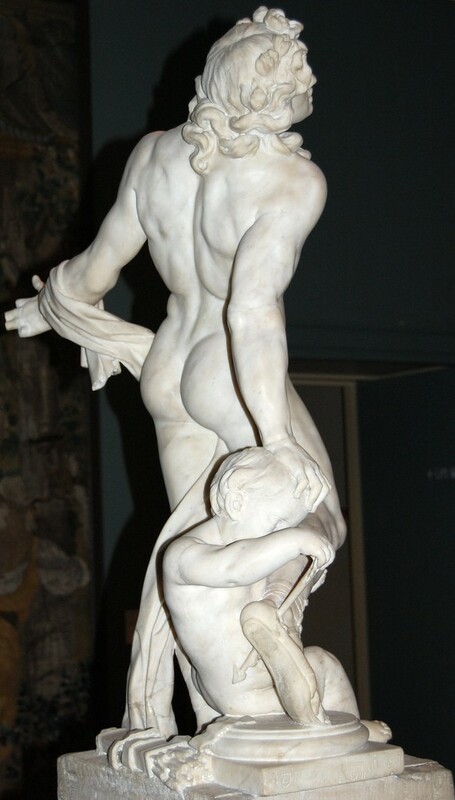 Veyrier's "Statue of Dying Achilles": I feel your pain, man. I recently suffered my worst sports injury. While pitching for the greater glory of the Reader in a media softball league game (16-inch, if you have to ask) I partially tore my Achilles tendon. After a bunch of damn ringers for the Tribune—none of them looking like Eric Zorn or Mary Schmich or even Steve Johnson or Phil Rosenthal—swatted the ball all over the field, the first woman to come to bat hit a dribbler right in front of home plate. I went running for the ball, but I swear it felt like the heel of my shoe somehow got hooked on the pitching rubber. I went down, and looked over my shoulder to see what had tripped me—and knew right away what I'd done. The worst part of it was my two daughters were there, hoping to get into the game later, but instead they had to usher their old man home. The pain of a full tear is said to be excruciating, but mine never hurt—a good sign, as my doctor informed me over the phone. An MRI the next day confirmed an only partial tear, according to the technician taking the images, who added he was no medical expert. I asked him how bad and he said, "It's pretty partial," with a sad nod of the head. Two millimeters, as it turned out, but almost fully across and enough to keep me from being able to put any weight on the toes or push off at all. The worst news came this week. After being fitted with a boot and told it was all right to walk and shop on it, just no strenuous activity, when I finally saw the specialist she said the treatment is the same whether partially or fully torn after surgery—six weeks entirely off it on crutches, and then six months of rehab. Until then no strenuous activity, no working out—not even swimming. I told the doctor I was pretty devoted to my fitness regimen. She said, "You know, walking on crutches is a pretty good upper-body workout." Was she ever right. It's like learning to use chopsticks—only giant ones you carry your body on. Looks as if I'll finally be firming up those flabby triceps it's such a nuisance to isolate. I thought about taking this opportunity to announce my official retirement from Clincher softball, but like any pro athlete I'm resistant to finally give up the game for good. I rode the elevator down from the specialist's office with another fellow wearing a boot just like mine. "The same." We smiled rueful smiles. "How'd you do yours?" "Shooting hoops with my boy. You?" "Softball." Said still more ruefully. Yet I know that guy's going to be shooting baskets with his son again some time, and I'll be damned if I won't make it back next year—just like Derrick Rose, who's going to have it a lot harder than I ever will. But next time I take the field, you better believe I'm going to remember to stretch first.